Anyhow, instead of getting a new keyboard, I chose a poor-man's solution: I built my own keyboard divider, so my hands can type with a little bit of privacy one from the other :). I designed two divider models, one which assigns the 6 key to the left hand, and another one which assigns the 6 key to the right hand; I like the former best, that's also the layout used by most famous ergonomic keyboards. Note that after I built my cool-tool I searched on Google to see if others have come up with a similar system, and I found a patent from 1921 about a typewriter keyboard divider and a shield for blind-typing. Interesting, and also I like those old technical drawings very much. Attached there are the PDF files ready for printing, and the SVG Inkscape sources for your own use (under CC by-sa). Let me know if you find it useful. I teach computers in an elementary school. I used a similar divider with the kindergarteners and first graders. It has helped them to remember that each hand stays in its own backyard. Mine didn't have the letters on the divider so I will be switching to your version. 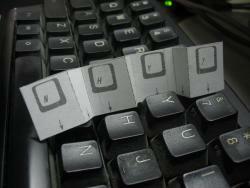 The should provide the students with the ability to place the dividers in the keyboard without my help. Cool, Art, I am glad someone else finds this actually useful. If you can take a picture of multiple keyboards using the divider, please send it to me.